Marinate shrimp ahead of time, in a mixture of olive oil, chopped garlic, lemon juice, pepper to taste, and finely chopped cilantro. Marinate in the refrigerator for at least 1 hour. Blend the remaining ingredients and check the seasoning. Add more salt if needed. Heat up the grill, season the shrimp with a bit of salt and cook until they turn pink. Be careful not to overcook the shrimp, so they don't become tough. Serve the skewers immediately, sprinkle with chopped cilantro, and garnish with the sauce. You can also use this grilled shrimp recipe for tacos, or serve it on top of white rice. Do you like seafood? Do you want an easy recipe to enjoy it? 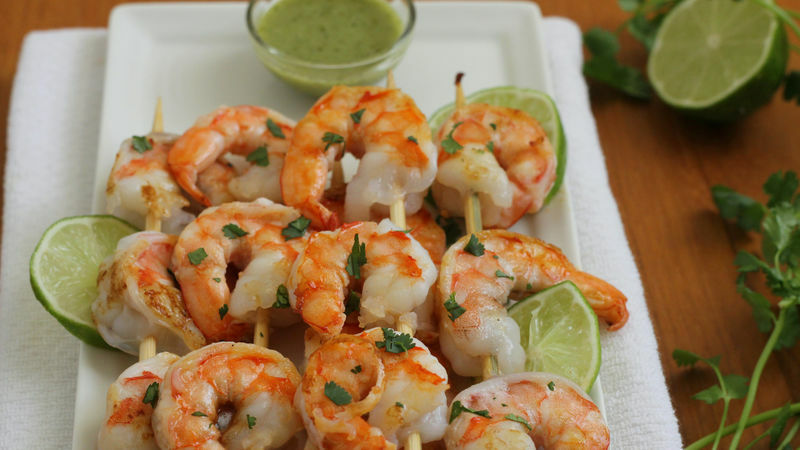 I have the ideal solution: delicious grilled shrimp with cilantro sauce. The trick is to marinate the shrimp ahead of time and then brown them briefly on the grill. They're served with a delicious garlic and cilantro sauce that you can also use to liven up other dishes. Get ready to fire up your grill and try this delicious recipe!